Are commercial fisherman putting of their own livelihood -- the time they would be spending fishing for salmon that they could sell at the market -- to clean this up? It's sort of a carnival atmosphere. There are small boats -- mostly small boats. But you know, fishermen love to fish. And so there is a certain sort of joy in it, but it's like a Fellini movie, there's the overshadowing despair that underlies it. Pacific salmon are central to our economy, our culture, and our environment in the Pacific Northwest, and are a critical part of marine and estuarine ecosystems in Washington state. Pacific salmon support treaty rights for Tribes throughout the region, commercial and recreational fishers, as well as predators like the endangered Southern resident orcas. 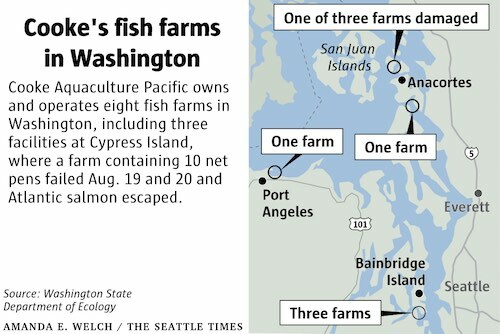 On August 19th, potentially hundreds of thousands of farmed Atlantic salmon were released into the Puget Sound ecosystem due to the structural failure of a net pen. 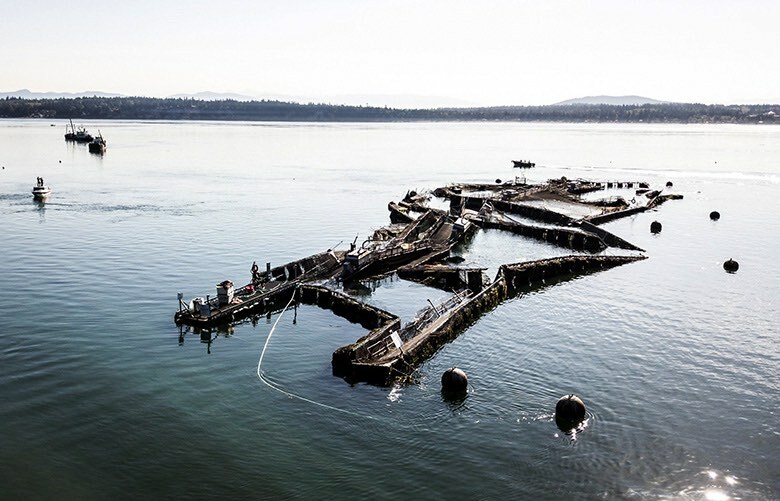 While the fish farm facility was permitted under Washington state law, the escapement may negatively impact resources under the jurisdiction of NOAA, the Army Corps, and other federal agencies. Most concerning is the threat farmed Atlantic salmon pose to the wild Pacific salmon populations stocks in Puget Sound. Farmed salmon tend to be larger and could out-compete wild salmon for critical resources such as prey and preferred habitat, which is important for spawning. According to WDFW (wdfw.wa.gov/ais/salmo_salar/), fisheries managers are concerned that the escaped Atlantic salmon may impact native fish stocks, many listed as threatened or endangered under the federal Endangered Species Act. Impacts, they say, could include competition, predation, disease transfer, hybridization and colonization. The state agency said findings in the draft report "are consistent with the findings of WDFW reported in 1999, i.e., evidence indicates that Atlantic salmon aquaculture poses low-risk to native salmon and non-salmon species." WDFW says that a risk assessment of Atlantic salmon aquaculture in the Pacific region by NOAA Fisheries is currently in process and will be released later this year. A 1999 WDFW report on Atlantic salmon aquafarming is at wdfw.wa.gov/publications/pub.php?id=00922.